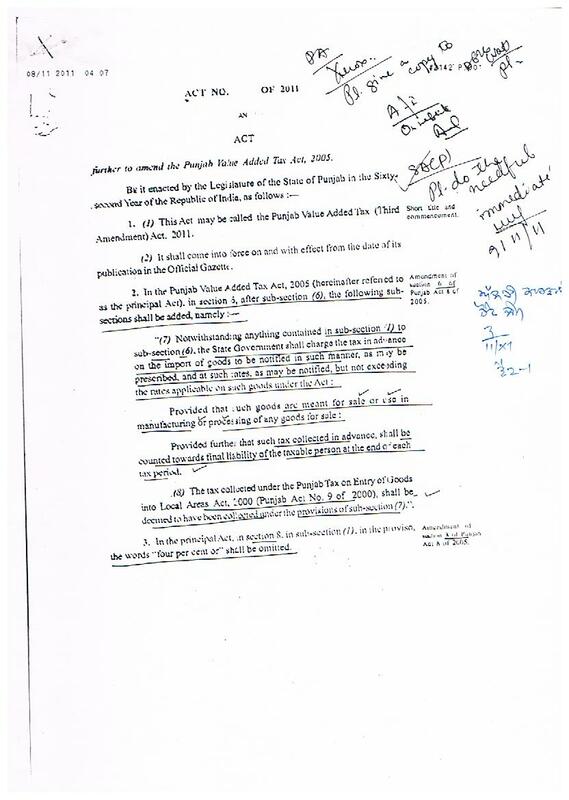 AMIT BAJAJ ADVOCATE: Entry Tax Act in Punjab amended-an attempt to remove defects? Entry Tax Act in Punjab amended-an attempt to remove defects? Punjab Government has promuglated a new ordinance so as to amend the Punjab Tax on Entry of Goods into Local Areas Act, 2000. By this ordinance word "Goods" in the said Act has been defined, section 3-A and section 4 of the said Act has also been amended. 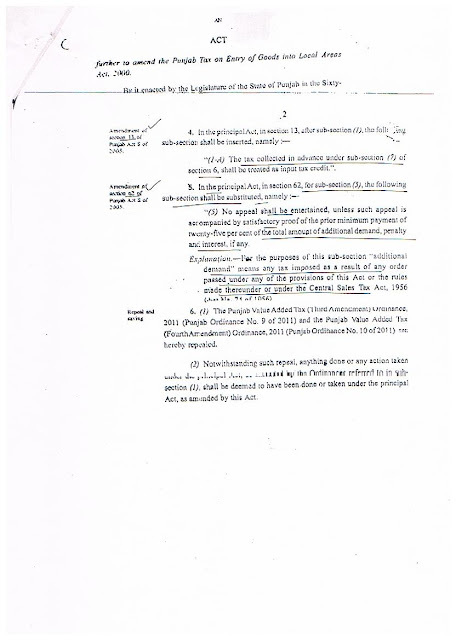 Amendments in entry tax: Collection of tax under section 3-A of the said Act was stayed by Punjab & Haryana High Court in Bhushan Steel case recently.One of the grounds for the grant of such stay was that charging section in the Entry Tax Act was section 3 whereas tax was levied u/s 3-A, which did not even prescribe the taxable event i.e the words "tax on the entry of goods into local areas" was nowhere mentioned u/s 3-A. Section 3-A simply stated that tax may be levied by State Government on such goods at such rates as may be prescribed. Another ground for stay of entry tax was that entry tax was leviable on goods mentioned in the schedule appended to the Act. But no goods were being mentioned in the schedule. Now newly amended section 3-A provides that there shall be levied a tax on entry of goods into local areas at such rates as may be specified from time to time. Now newly amended section 3-A states the taxable event i.e entry of goods into local areas, thus may it be now treated as charging section? 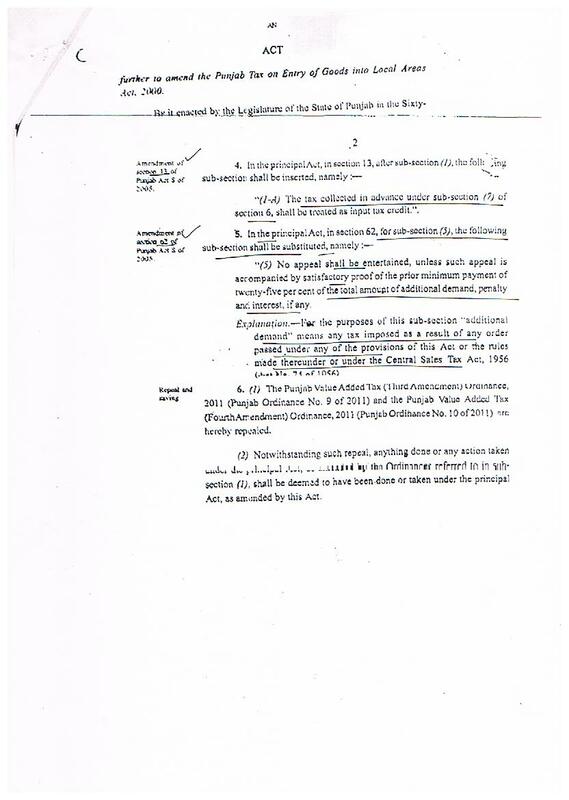 The definition of Goods have been incorporated now in the section 2(2)(dd) which defines Goods as "the goods notified for the purpose of entry tax under this Act;" The question now is whether by the above amendments, deferments from entry tax which have been earlier taken by many persons on the behalf of stay granted by Punjab & Haryana High Court have come to an end? Advance tax under VAT justified? : Newly added sub-sections 6(7) & 6(8) under the Punjab VAT Act provide for levy of advance tax on certain goods which are to be notified and also state that entry tax under the said Entry tax Act will be treated as advance tax of VAT. It should be noted that tax levied under Entry Tax Act is being levied under entry 52 of State list of Seventh Schedule to the Constitution of India, whereas Punjab VAT Act has been enacted under entry 54 of the State list. Where entry tax is a tax on the entry of goods into local areas of a State and should be a compensatory tax in nature, VAT is a tax on the sale and purchase of goods within the jurisdiction of the State. The question is whether levy of a single tax under one entry in the State list can be treated as tax levied in the other entry also, when the sphere of both the entries is different altogether? First proviso to newly added section 6(7) provides that advance tax shall be leviable only if such goods are meant for sale or use in manufacturing or processing of any goods for sale. It means that if goods are being imported in the State otherwise than as sale then no advance tax will be payable on such import of goods. One more point is notable here that if goods are imported and used in the manufacturing of tax free goods even then advance tax will be payable as the words used u/s 6(7) is any goods. However second proviso to section 6(7) provides that such tax collected in advance shall be calculated towards the final liability of the taxable person at the end of each tax period. Thus it means that if a person imports some goods on which advance VAT is leviable and thereafter manufacture tax free goods out of it then his final liability will be nil as a result of which if advance tax paid by him has to be counted towards his final liability then such advance tax should be refunded to him at the end of such tax period. It is settled law that collection of tax on some transaction on which otherwise no levy of tax can be made, will not be justified even if there is a provision for refund of such tax afterwards. In CWP No. 19355 of 2010 -KRBL Limited v State of Punjab and others, decided on 14.1.2011, it was held by P&H HC that recovery can be effected only if it is within the competence of the State Legislature. It cannot be recovered initially providing the remedy of refund later on. Thus the above observation also raises a question mark on the levy of advance tax on goods imported iof such goods are being used in manufacture of tax free goods. All the above questions require due consideration and discussion from the legal fraternity as well as the judiciary. Amit thanks for the detailed information, however the above does not conclude the current status of entry tax, i.e. whether this amendment has superseded the stay on entry tax and whether govt. of punjab can collect entry tax. Conclusion is left open to be decided by judiciary. However my personal view is that unless Advance VAT is challenged in the HC, the Advance VAT in the shape of entry tax under the amended law may be treated as seperate by the revenue authorities from the one stayed by HC. It is also not clear as yet whether the notification of advance vat is published in the official gazatte or not as it is to be applicable from the date of its publication.